Food trucks with sustainably sourced local food will be there including Harvest Mobile Cuisine, Fronana and the Flying Santucci Brothers Organic Cotton Candy along with booths from local educational organizations, local crafters, farmers and herbalists. Liv music from bands including Seefari, Ludlow And SPECIAL GUESTS from Chattanooga, The 9th Street Stompers as well as local craft beer will be on tap! The event runs from noon to 6pm and admission is free! Garden Station is a 2 acre community garden & urban farm, art park, sustainable living education center, and community meeting place in the heart of downtown Dayton, Ohio. We have demonstration gardens featuring permaculture design, natural building and educational murals. We teach over 60 free hands-on, DIY sustainable living classes each year on a variety of topics including beekeeping, organic gardening, permaculture, food preservation and preparation, herbal remedies and more; 40 of those classes occurring at EarthFest, which attracts over 4000 visitors. Our urban farmer’s cooperative, “Dayton Urban Grown”, helps to subsidize new urban farmers through sharing of resources and equipment. Over 500 volunteers come each season to visit, take a guided tour and work for 3-5 hours at a time. 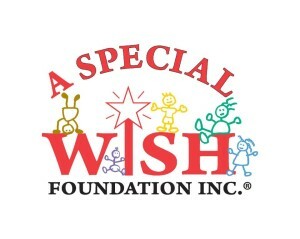 Our core team are also all volunteers, we are an Ohio Non-profit organization, have no paid staff and operate entirely by community donations and small community grants. Our founder is a Master Organic Gardener, Permaculture Certified and has taken classes in urban agriculture from Will Allen and Jean Martin Fortier, natural building classes at Blue Rock Station and is a graduate of Rocky Mountain Seed Alliance Seed School. This season (2016) will be our first spring and summer with our new hoophouses and we will be constructing a wash/pack station and walk-in cooler. We are working with several partners to develop a training program in small scale, no till, intensive urban farming. We grow organically but are not certified. Internship Starts: ASAP Internship Ends: Negotiable, would like at least 4 month commitment Number of Interns: 1 with room and board for 20 hours/week and 2 or more at 5 hours a week Minimum Length of Stay: Three months. At least four would be desired. Meals: Meals are not provided, with the exception that many of the ingredients are as a weekly produce share. Skills Desired: We would love someone with a strong work ethic and attention to detail who is willing to learn! You need to be in good physical condition as the work is mostly manual labor; and self-motivated, with the ability to problem solve but willing to take direction. It is likely you would also be supervising high school age workers. There may be some organizational work to do with the farmer training program and workshop series as well. Educational Opportunities: We would love to help someone get started with their own urban farm and will share our knowledge. All our workshops are available to our interns as well. Stipend: This is considered a volunteer position but we are willing to provide a stipend of $40/ week as well as a share of the harvest as a thank you for at least 5 hours of work per week. For twenty hours a week we will provide room and board as a shared house with one of our volunteers as well as $600 for the season. You will be responsible for taxes. Bonuses may be given based upon our success. Housing: Housing is available for the twenty hour per week position only. Internship Details: We would love someone who has a real interest in learning how to grow produce using organic methods for market! You will work a regular schedule, probably at least 5 consecutive hours in a day from 7 am – noon on a weekday (probably Monday through Wednesday), or Friday early evening to harvest for Saturday Market. You will be planting, weeding, harvesting, mulching, watering, maybe doing light construction or supervising school age volunteers. We also could use help scheduling and marketing the workshop series. You read that right! Sword fighting in Garden Station. Among the garden plots of tomatoes, cucumbers and peppers a sword fight or two will happen this weekend. Dayton’s all volunteer BeSpoke Theater will be sharing their production of Macbeth for free this weekend. Bring a lawn chair and a few dollars for a cold 5th Street Brewpub beer and enjoy the show nestled into the back Garden Station. Bespoke is one of Dayton’s newest production companies specializing in Classical Theatre. 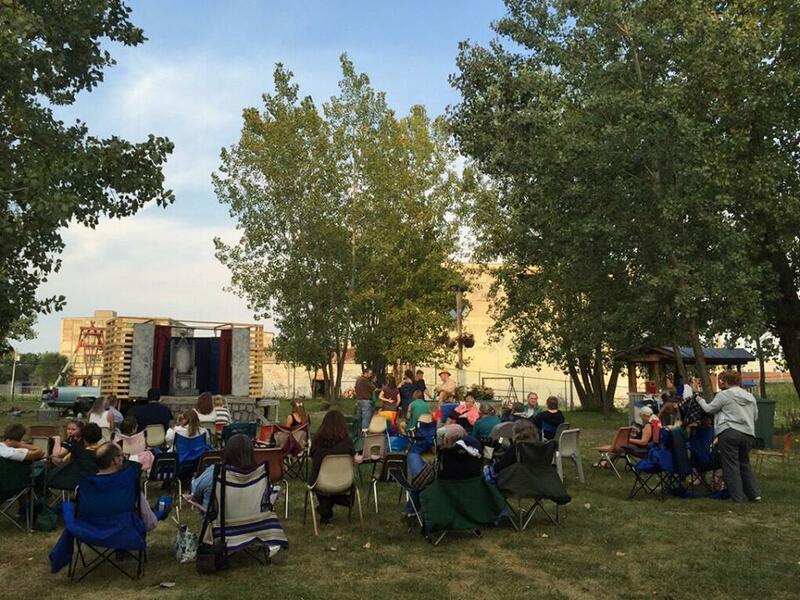 Shakespeare in the park is a lot different than enjoying a show in a traditional theater. The actors compete against the elements and surrounding environment. When Macduff has to pause for a passing train or Lady Macbeth has to enunciate beyond siren moving up Wayne Avenue. I was in attendance for the Sunday afternoon performance last week and found the benefits outweigh the distractions. First, much of the story of Macbeth happens in the out of doors. The sounds of buzzing cicadas added to the story. Tonight’s show and Saturday’s as well will be visually more interesting as the torches come out as the sun sets in Dayton. 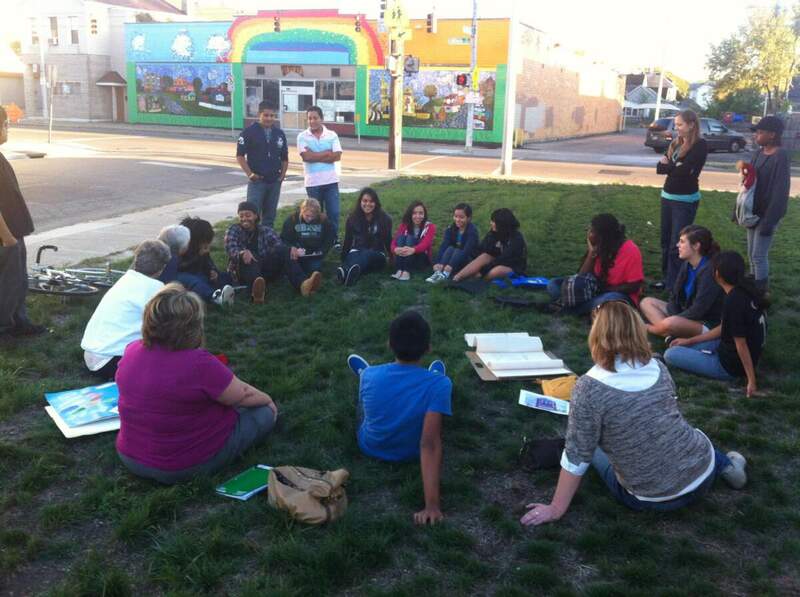 Outdoor theater also allows the actors to bring the story withing feet of the audience. Having Banquo or Malcom run past you so close you feel it is an experience you normally don’t get in the Schuster or Victoria. There are three shows remaining. 7:00 pm Friday and Saturday and a 4:00 pm start on Sunday. The show is free and donations are accepted at the end of the show. Stop in to Garden Station, soak up the city with a 5th Street Brew and take in some Shakespeare. The price point is perfect and the venue is perfect for children and families. Call for submissions: EarthFest 2015 Poster Contest! 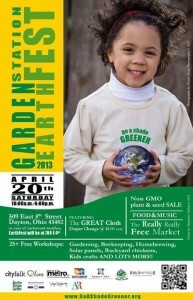 EarthFest is a volunteer-created Earth Day Festival hosted by Garden Station featuring over 35 hands-on DIY Sustainable Living Workshops, Live Local Music, Booths by over 40 environmentally friendly organizations, a non-GMO Heirloom Plant Sale and more! The first EarthFest happened in 2013, was organized by 2 people and over 1000 attended. Last year a team of 7 volunteers organized the event that drew almost 5000 attendees. 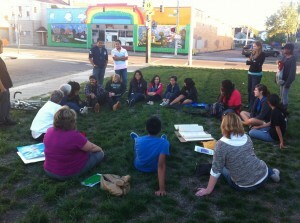 This year a Neighborhood Mini-Grant by the City of Dayton was awarded to expand the festival. A part of that expansion includes inviting local artists to design this year’s EarthFest poster and offering a $200 cash prize to the winning design. A committee comprised of artists, representatives from local eco-friendly organizations and EarthFest organizers will select the winning design. Designs will be judged based on originality, appropriateness for the event and design quality. Multiple submissions are encouraged. Submissions may be submitted in any format or size, as long as the proposed design is clearly illustrated. Designs that can easily be used in computer design are encouraged. 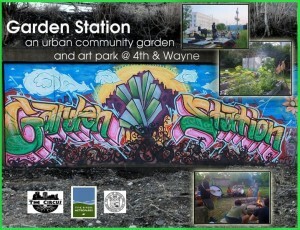 Additional donations are also being accepted to help fund EarthFest at http://daytongardenstation.org/ with an Indiegogo fundraiser starting in February. 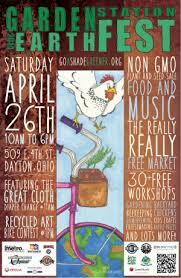 Environmentally friendly organizations are invited to sponsor a classroom and the music stage for EarthFest 2015. Donations help cover tents, advertising, workshop materials and other expenses. Any extra money raised will go towards expanding the urban farm at Garden Station by adding a hoophouse greenhouse and produce refrigerator next growing season. If you have questions or need additional information, please contact Lisa at [email protected] or 937-610-3845. Why should your best throw-aways go to the curb when those recyclables also make the best art supplies? 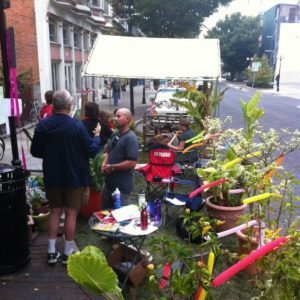 This year you can show your neighbors just how creative you are when you participate in the first ever Garden Station Recycled Art Bike Contest. Be outrageous. Be daring. Bring on the flair and win prizes and bragging rights for the year. Turn your bicycle in a functional work of art by reusing materials that would normally go to a landfill or recycling center. 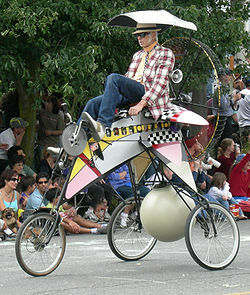 Anything you can think of can become a part of your ride when you make a statement about reuse of materials, everyday art and the best form of transportation for you and the community. Best of Show, Most Creative, and Best use of Recycled Materials are three of the categories to win. Entries must be ride-able as you dazzle the community with your cycling-flair, talent and skills. 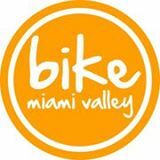 Bikes will be reviewed at 1pm, Saturday, April 26th at Garden Station by our panel of highly capable judges including local artists and representatives from Bike Miami Valley. After judging, participants will embark on the parade ride lead by Courteous Mass Dayton. The ride will leave Garden Station to cruise through the Oregon District to the 2nd Street Market and back to Garden Station where the winners will be announced. As word is getting out about this event, more prize donors are stepping up, but be prepared to win some really fun gifts from local merchants and sponsors. There is no entry fee and registration and the lineup of entries will take place just before the judging at 1pm. 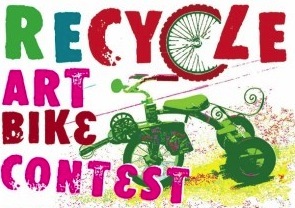 If you would like to participate as an artist, a rider, or a prize sponsor visit the Garden Station Facebook page or email [email protected] or join the event at the Facebook Page: Recycled Art Bike Contest @ EarthFest! Volunteering is the perfect way to feel connected to your community. The simple act of offering your skills and enthusiasm will positively impact the lives of others, as well as your own. 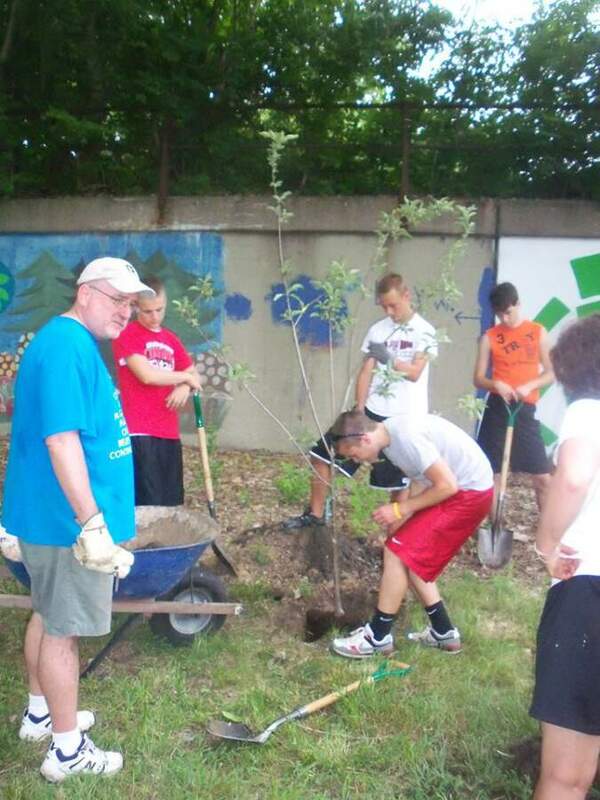 Volunteering provides many benefits to both mental and physical health. Volunteering can provide a healthy boost to your self-confidence, self-esteem, and life satisfaction. You are doing good for others and the community, which provides a natural sense of accomplishment. Your role as a volunteer can also give you a sense of pride and identity. And the better you feel about yourself, the more likely you are to have a positive view of your life and future goals. Reducing the risk of depression is another important benefit of volunteering. A key risk factor for depression is social isolation. Volunteering keeps you in regular contact with others and helps you develop a solid support system, which in turn protects you against stress and depression when you’re going through challenging times. Volunteering is good for your health at any age, but it’s especially beneficial in older adults. Studies have found that those who volunteer have a lower mortality rate than those who do not, even when considering factors like the health of the participants. Volunteering has also been shown to lessen symptoms of chronic pain or heart disease. 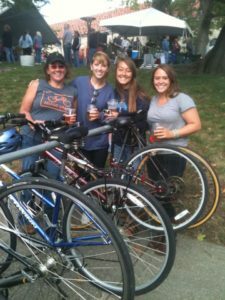 Bike Miami Valley is looking for a group to handle bike valet parking at Oktoberfest for Sunday, 29 September! Want to support cycling? Love beer? Here’s your chance! Bike Miami Valley encourages all local festivals to have bike valet parking – and Oktoberfest is out front! We need a group to provide people to handle bike valet parking – racks provided. You have a chance to set up a table, sell t-shirts, promote your organization – and get free admission (a $12 value) to Oktoberfest! Send an email if interested! 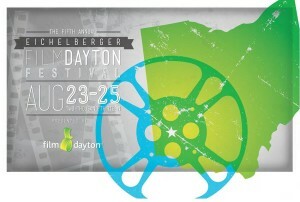 FilmDayton‘s 5th annual festival is coming Aug 23-25th, headquartered at The Neon, and they could use a few more volunteers to cover all the bases. They need folks for set-up, ticket takers, greeters and odd jobs, too. Fill out the online form and volunteer for a shift – you get a free movie ticket out of the deal, too! 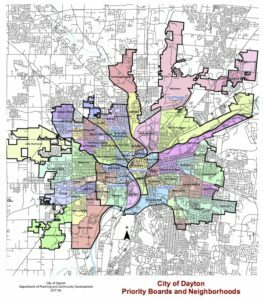 MostMetro will be updating these opportunities each week. If your organization has a need for volunteers, email us your info and we’ll include you in the next update. A group of HS students from Ginghamsburg church planted 2 figs, 2 chestnuts, a persimmon, 1 apple, some yarrow, bee balm and fennel and 1 serviceberry. 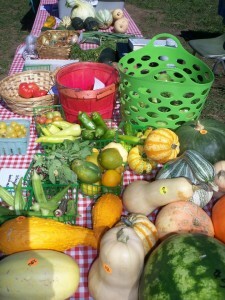 Garden Station Sunday Market will start this Sunday as the only local produce outlet in Montgomery County which is open on a Sunday. It will start in a more compact version until more urban farmers and artists join us and consumers create more demand. It will run 11am to 2pm and will start with one booth combining produce from the Greater Dayton Urban Farmer’s group, including produce from the NEW market/demonstration farm at Garden Station. Garden Station feels that demand for local, organically grown produce is increasing and are encouraged by the turn out of over 1000 people for our EarthFest and almost 300 for the local March against Monsanto, but we need more individuals to step forward who are committed to help us work towards a more vibrant local food system. Please comment below if you’d like to help Garden Saation. Our famers have too many family and other work commitments that need to take priority this year so our larger market events will occur for First Fridays this year for “Local Day at Garden Station”. 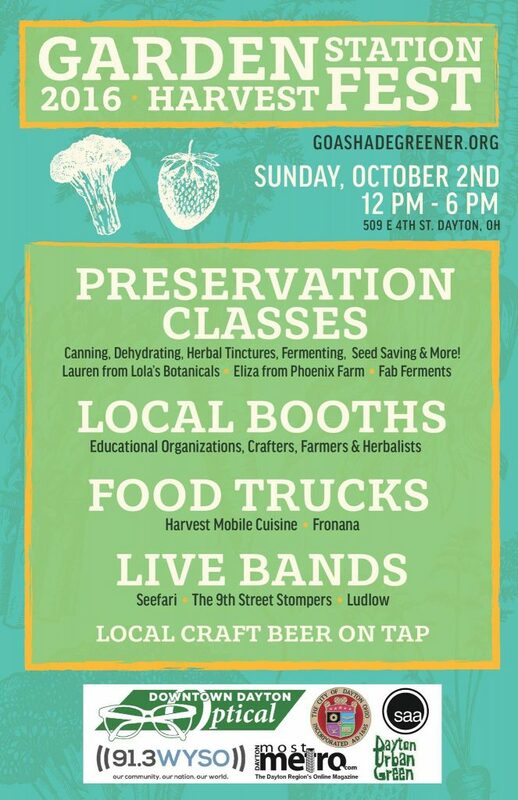 Local Day will feature at least 2 free sustainable living workshops every month as well as live local music and our Greater Dayton Urban Farmer’s Market. Local Day will run from 5:30pm to dusk on the First Friday of every month through October. The Sunday Market will run weekly from June 16th through mid October on Sundays from 11am-2pm. The AARP is supporting the production of local produce at Garden Station by helping fund our market/demonstration gardens and arranging for a portion of the produce grown at Garden Station to be donated to seniors at Jaycee Towers, just a block from the gardens. Please show your support for our local farmers and local, organically produced foods by shopping local! This information originally appeared on Garden Station’s Facebook event page.